"Kentucky Woman" / "Hard Road"
"River Deep - Mountain High" / "Listen, Learn, Read On"
"The Book of Taliesyn" is the second studio album by English rock band Deep Purple, recorded only three months after "Shades of Deep Purple and released by Tetragrammation Records in the United States of America, and harvest Records in the UK in October 1968, just before their first US tour. The name for the album was taken from the 14th-century Book of Taliesin. The structure of the album is similar to that of their debut, with four original songs and three rearranged covers, although the tracks are longer, the arrangements more complex and the sound more polished than on Shades of Deep Purple. The music style is a mix of psychedelic rock, progressive rock and hard rock, with several inserts of classical music arranged by the band's keyboard player Jon Lord. Deep Purple's American record label aimed at a hippie audience, which was very influential in the US at the time, but the chart results of album and singles were not as high as expected. This setback did not hinder the success of the three months long US tour, when the band played in many important venues and festivals and received positive feedback from audience and press. On the contrary, Deep Purple were still an underground band which played in small clubs and colleges in the United Kingdom, largely ignored by media and public. The British record company EMI released "The Book of Taliesyn" only in June 1969 on the new underground prog rock sub-label Harvest Records, but the album did not chart. Even the release of the new single "Emmaretta" and new dates in their home country in the summer of 1969 did not increase the album sales or the popularity of Deep Purple in the UK. Perception of the album changed in modern times, when it received more favourable reviews. My main complaint about Deep Purple is that when we did get some success, which was very, very quickly after we started, we were just worked to death by the management and the record company. Deep Purple were booked for a long tour in the United States, starting in October 1968, as a result of the unexpected success gathered in North America by their debut album "Shades of Deep Purple", fronted by the hit single "Hush". The single, released in June, had reached No. 4 in the US Singles Chart and No. 2 in Canada and was the main reason of their sudden popularity overseas. The situation was quite the opposite at home, where the band had been heavily criticized by media and audience. In July, band and crew relocated from West Sussex to London. Their management rented a house at 13 Second Avenue, Acton Vale, which was used as living quarters and for preparing the upcoming US tour when not away for gigs or promotion. Guitarist Ritchie Blackmore went to live there with his German fiancée Babs Hardie. Executives at Tetragrammation, Deep Purple's American label, thought that it would have been more profitable to have a new album to promote during the US tour, besides the already successful Shades of Deep Purple. Moreover, the eight tracks recorded in May for Deep Purple's debut album and performed live in the British gigs of July and August were deemed insufficient for their shows as headliners in the US. For these reasons, they were pushed back into the studio just a couple of months before the tour began, even though their debut album had not been released in the United Kingdom yet. The request of the record label to record a new album only three months after their debut found the band unprepared, because the intense activity after the release of "Shades of Deep Purple" had left very little time for writing and rehearsing new songs. Under pressure, the musicians eventually came up with four lengthy original compositions, but to fill up the new album they reworked and expanded three cover songs, following again the example of the American band Vanilla Fudge, which many band members admired. The first was "Kentucky Woman", a hit single for Neil Diamond in 1967 which Deep Purple performed live at a BBC session in August. Though written by Diamond, Deep Purple's version musically leans toward the style of Mitch Ryder's recording of "Devil With a Blue Dress On". The second cover was "River Deep - Mountain High", a single released by Ike & Tina Turner in 1966. Finally, the 1965 Beatles song "We Can Work It Out" was chosen after Paul McCartney himself had reportedly expressed appreciation for Deep Purple's version of "Help"
On the first of August 1968, Deep Purple entered De Lane Lea Studios in Kingsway, London, with producer Derek Lawrence and sound engineer Brian Aintsworth, who had both worked on their previous album. Tetragrammaton's advance of $250,000 had been used to book two weeks in the studio, a time which covered songwriting, rehearsals and recording sessions. Time was granted in larger amount than for the making of Shades of Deep Purple in May, feeding the band’s ambition of coming up with better original material than their previous effort. Deep Purple recorded "Shield" and "Anthem" on the first day. On the first song Ian Paice plays a complex drum pattern which sounds like a repeated clash of glass objects, while the second one required a string quartet for the baroque style interlude in the middle. The following days they proceeded with the composition and recording of "Exposition/We Can Work It Out" and of the original track "Listen, Learn, Read On". On 19 August, they concluded these sessions with the recording of "Kentucky Woman" and of the heavy and up-tempo instrumental "Wring That Neck", which came out from a tight collaboration between Blackmore and bass player Nick Simper. The name "Wring That Neck" comes from a phrase the band used when they were playing live, describing the bassist or guitarist really bursting at their instruments to create a hard noise (i.e., squeezing, or "wringing", the neck of the guitar). Another instrumental called "Playground" was written and recorded on 18 August, but the lyrics were never completed and it was eventually discarded. "River Deep - Mountain High" was always intended as the final track, so its recording was postponed until the other tracks were finished. The musicians’ perfectionism required extra time to complete the track and it was taped only on 10 October, a long time after the planned deadline for studio recording. The mixing was supposed to be overseen by the band members, but their schedule in October was so tight that Lawrence did it without them. This dismayed the band at first, but the sound turned out cleaner, heavier and more polished than on their debut. The tapes were mixed in both mono and stereo, but the mono tapes were trashed, as neither Tetragrammaton nor EMI, Deep Purple's British label, had any use for them. The album was released in the United States in October 1968, just in time for the tour. The American label insisted on changing the title of the instrumental "Wring That Neck", considered too violent, to "Hard Road". The track was used as B-side of the single "Kentucky Woman", issued in December 1968. The Book of Taliesyn reached No. 54 in the US chart and No. 48 in the Canadian chart. The single peaked at No. 38 in the US and received much airplay, but did not replicate the success of "Hush". We were big business in America, EMI did nothing, they were stupid old guys. 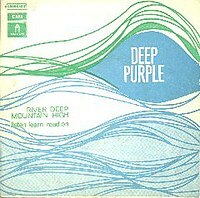 In an attempt to improve sales of the album, a shorter and heavily edited version of "River Deep - Mountain High" was released as single exclusively in the United States and Canada in February 1969, with "Listen, Learn, Read On" as the B-side. It reached No. 53 and No. 42 respectively in the two countries and was not a success, charting lower than "Kentucky Woman". The album was distributed in Canada (in 1968) and Japan (in June 1969) by Polydor Records. EMI delayed the release of the album in the UK to June 1969, after the band had come back from the US and set up a proper tour of their home country. By that time, the band had already recorded and released their third album Deep Purple in the US, and recorded a single with a new line-up. "The Book of Taliesyn" was the first release by Harvest Records, a new sub-label which EMI executives had devised as an outlet for British underground progressive rock groups. "Kentucky Woman", with "Wring That Neck" as B-side, was the only single released in the UK in December 1968, but it was retired after only six weeks. Just as it had happened with "Shades of Deep Purple" the year before, both album and single received little promotion and were widely overlooked, selling much less in the UK than overseas. The musical style of "The Book of Taliesyn" is a mix of progressive rock, psychedelic and hard rock and different observers think that in this album the band is more mature and in greater control of its own means of expression. Critics highlight how the compositions are generally longer and more complex than in their debut album. 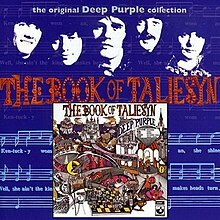 Deep Purple biographer Dave Thompson writes that a dark mood permeates "The Book of Taliesyn" with little indulgence to pop rock, citing influences of the American band The Doors in the original tracks written for this album. The influence of keyboard player Jon Lord's classical music upbringing is felt strongly in all the tracks, but this time he was not the main responsible for songwriting and arrangements, which are considered by critics Deep Purple's first real group effort. Lord's interest in mixing rock and classical music would culminate in late 1969 with his "Concerto for Group and Orchestra" suite, but he already defined Deep Purple as a symphonic rock band in a 1968 interview. Nick Simper complained about Lord's excessive influence in composition and arrangements in a 1983 interview, which he said "resulted in a lack of direction for the band." "Anthem" is perhaps the band's deepest venture into classical music on a regular studio album, with its baroque style interlude reminiscent of a Bach fugue written by Lord and performed using Mellotron and string quartet. A similar approach can be found on King Crimson's debut album, released a year later. Rearranged excerpts from the second movement of Beethoven's Symphony No. 7 and Mellotron Ouverture-Fantasy are in the instrumental intro "Exposition", while "River Deep, Mountain High" is introduced by the notes of "also sprach Zarathustra", written in 1896 by Richard Strauss and very popular after its inclusion in the film 2001: A Space Odyssey, screened earlier in 1968. "Wring that Neck" and "Kentucky Woman" show more traces of the heavier music that the band would embrace in their 70s albums with the Mk.II line-up. Blackmore's guitar work is generally praised by critics. However, in a recent interview, the guitarist defined the album as "lame" and remembered that he had not yet found his own style of guitar playing at the time of recording. The lyrics written by the band's singer Rod Evans are very functional to the music and the marketing Deep Purple's record label was building up for the American hippie audience. Evans took inspiration for the fantasy-themed "Listen, Learn, Read On", which contains lyrical reference to the album's title, from the 14th-century Welsh manuscript Book of Taliesin, a collection of poems attributed to the 6th-century poet Taliesin. The title and cover art of the album were also inspired by the manuscript. Instead psychedelia and its rituals play a large part in the lyrics of "Shield". Simper thinks that Evans' lyrics are "far better than anything (...) has ever been written in other line ups, in Deep Purple." The agent gave me the title saying that the art director wanted a 'fantasy Arthurian touch' and to include hand lettering for the title and the musicians' names. I mainly drew from The Book of Taliesin, which is a collection of poems, said to be written by the sixth century Welsh bard Taliesin. The fee for the job was £30, minus 25% for the agent. John Vernon Lord was, until recently, Professor of Illustration at the University of Brighton. The group have done some fine things for Radio One and they excite when they play live. I don't understand where this record went wrong, it is all too restrained somehow. They recorded "Wring That Neck" much better for a recent Top Gear. American reviewers were enthusiastic of Deep Purple's live performances and the lack of a new successful single apparently did not ruin the positive perception of the band in the US, to the point that they were often addressed as an American band. Band members even thought about transferring their residence in the United States, but renounced when they learned that the 21 year old Paice could be drafted for the Vietnam War. Modern reviews of the album go from positive to mixed. Joe Viglione of AllMusic compares Deep Purple's production to Vanilla Fudge's, underlining how the two bands covered songs from the same authors and used similar arrangements. 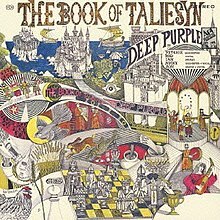 He writes that on The Book of Taliesyn Deep Purple veered more towards progressive rock than their American counterparts, combining meaningful lyrics and "innovative musical passages". On the contrary, PopMatters criticizes the "Spinal Tapish" lyrics and the lack of hit material on the album with the exception of "Wring That Neck", considered "perhaps the first real Deep Purple composition." Blogcritics reviewers stress how the original material, and "Wring That Neck" in particular, "stands the test of time well". However, Greg Barbrick finds "Jon Lord’s classical leanings (...) a bit too much" on tracks like "Exposition" and "Anthem", where they "threaten to derail the proceedings". All credits adapted from the original releases. Jon Lord – Hammond organ, keyboards, backing vocals, strings arrangement on "Anthem"
UK Harvest SHVL 751 stereo (1968). Matrix A-1G / B-1G (no EMI box logo on labels). Album produced by Derek Lawrence. The albums original laminated gatefold cover is in excellent condition, displaying only minimal signs of wear. The album cover has a strong hinge and spine, displaying very clear printed script. The original Harvest inner sleeve is excellently presented.